Over the past 7 years, we have grown our fuel pump line to include 12 unique models that provide a wide variety of flow and fitment options. However, the ever increasing power outputs of today’s aftermarket engines have created the need for a new in-tank pump with flow capabilities beyond anything currently available. Today, we are answering that call with the release of the DW400 in-tank pump. The development of a 400+ LPH pump in a footprint small enough for in-tank use is a significant engineering feat. To ensure success, we turned to Bosch Automotive Aftermarket to find a solution. DW and Bosch have a long standing relationship which has resulted in several fuel injector products. 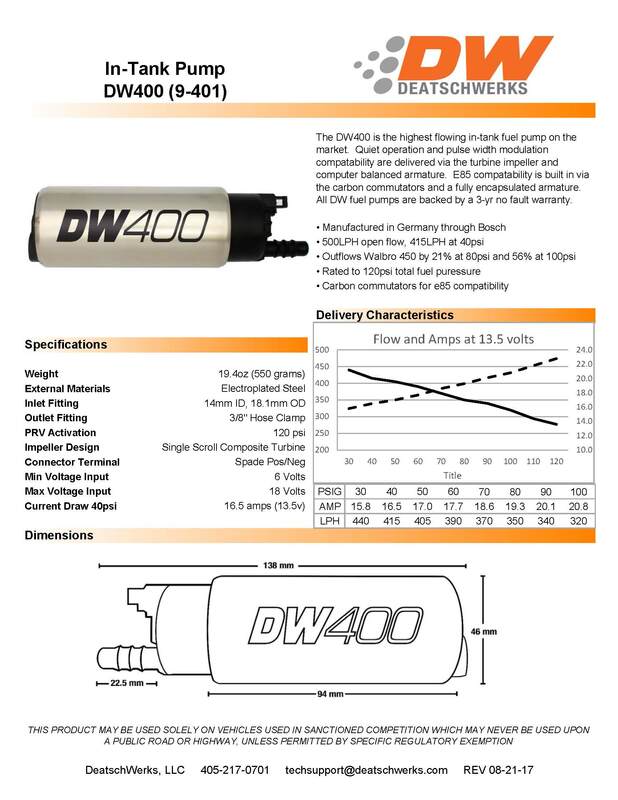 The DW400 represents the team’s first collaborative fuel pump product. The pump is manufactured by Bosch in Germany. Final QA, packaging, and sales are performed by DW in Oklahoma City, OK. Anyone who has experience in building high horsepower cars has learned the value of simplicity. The K.I.S.S. method is well established in the high-performance aftermarket and applies to fuel systems just as much, if not more, than other aspects of a performance build. The gold standard of simplicity is a single in-tank fuel pump. A single in-tank pump is less complicated, less expensive, lighter weight, quieter, and more reliable than any other fuel delivery method. For all these reasons, we at DW, are big fans of keeping the pump in the tank. There is one drawback, however… there is a limit to the power a single in-tank pump can support. With the release of the DW400 pump, this limit has just been raised! The DW400 is the highest flowing brushed in-tank pump on the market. But the flowrate of 500LPH at 0psi and 415LPH at 40psi only tells part of the story. Much more important than high-flow at low pressure is a pump’s ability to hold on to that flow under high loads of fuel pressure and boost pressure. The pressure range of 70-100 psi is where modern boosted EFI engines make their peak power and thus need their pumps to perform at their best. Since the DW400 was engineered with this in mind, it was no surprise that it significantly outperformed the benchmarked Walbro 450 “e85”. During side-by-side comparisons, the DW400 did flow 5% more at 40 psi, but more meaningfully, flowed an average of 31% more in the 70-100 psi range. The resulting pump exceeded our high expectations not only for performance, but also for quality. The DW400 exemplifies the high engineering and manufacturing standards of Bosch, GMBH. Features include: carbon commutators and brushes, fully encapsulated and machine balanced armature, PWM compatible composite turbine impeller, and die cast metal inlet endcap. The DW400 is manufactured in Germany and then delivered to Oklahoma City, OK where DW performs final QA testing, packaging, and distribution. All this performance is packaged into a 46mm body which will fit into many OE aftermarket pump modules. The 46mm body is a 16% smaller footprint than the Walbro 450 “e85” 55mm bell bottom. However, it is also a 7mm diameter increase from a standard 39mm pump. Therefore, modifications may be needed to fit the pump into OE modules. 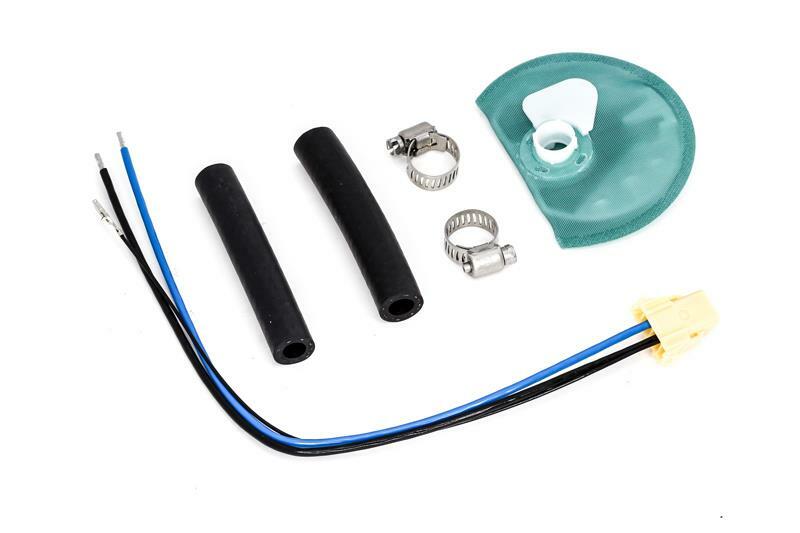 The DW400 includes a universal install kit containing a filter, electrical harness, hose, and clamps. Want this item shipped on April 22? Order within the next 46 hrs 41 mins.